Enjoy unbeatable multi-core value and ultimate high definition entertainment with the AMD Phenom II X4 970 Black Edition. Save time and accomplish more with true multi-core processing that makes multitasking quick and simple. AMD64 with Direct Connect Architecture and 45nm technology has created a tuned processing pipeline that helps keep your system performing at the highest levels. HyperTransport technology provides up to 16.0GB/s bandwidth to reduce system bottlenecks and AMD Balanced Smart Cache ensures quick access times to highly used data. Energy efficiency is important to AMD, allowing you to enjoy a cool, quiet PC while saving energy and reducing heat, noise and the effect of your computer on the environment. Energy efficiency innovations include Cool’n’Quiet and AMD CoolCore, which reduce power consumption by balancing the processor activity, letting you enjoy environmentally friendly, energy-efficient performance. 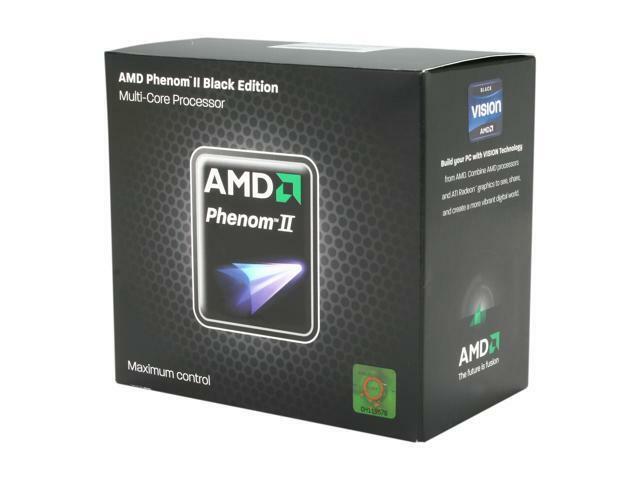 AMD Phenom II processors also offer support for Virtualization Technology. You can run virtual environments on one system with ease, allowing you to use legacy programs on a separate operating system. Add the convenience and power of multi-core processing and enjoy the benefits of energy efficiency with an AMD Phenom II X4 970 Black Edition today! Black Edition Processor with Unlocked Multiplier With the power of four processor cores on a single chip, the AMD Phenom II X4 970 BE delivers industry-leading multitasking performance with each core owning L2 cache and sharing 6MB L3 cache. Its multiplier is fully unlocked for easy overclocking. AMD64 with Direct Connect Architecture AMD64 technology allows the AMD Phenom II X4 970 BE to run 32-bit applications at full speed while enabling a new generation of powerful 64-bit software applications. Moreover, all AMD Phenom II processors are built on AMD’s revolutionary Direct Connect Architecture, where processors are directly connected to one another. An I/O and memory subsystem is also directly connected to each processor, helping improve overall system performance and efficiency. Integrated Memory Controller The AMD Phenom II X4 970 BE features a high-bandwidth, low-latency integrated memory controller that directly connects the processor to memory for optimum performance, low latency, and high throughput. HyperTransport 3.0 Technology HyperTransport Technology (HT or HTT) is a high-speed, low latency, point-to-point link designed to increase communication speeds between integrated circuits in computers, servers, embedded systems, and networking and telecommunications equipment. With HT 3.0 technology the AMD Phenom II X4 970 BE quad-core processor enjoys 4000MHz system bus speeds. AMD Power Management Technologies CPU power management technologies including AMD PowerNow! 3.0 (Cool’n’Quiet), CoolCore, and Dual Dynamic Power Management result in proven, measurable benefits for businesses and consumers, including reduced power usage, lower energy costs, and greener PC operation. Pros: The Black Edition Phenom processors are a great product that's built to last. Obviously not the bleeding edge after 7 years in service, but I'm sure my next processor will be an AMD, too. - Never was ever really hot, around 65 celsius under load with the stock heatsink in a 85-90 (Fahrenheit) ambient temperature room. I live in Florida.. don't ask..
Cons: - Could not overclock this CPU whatsoever, I don't know if it was my motherboard or what but overclocking using the multiplier either only overclocked one core or did nothing. My only real option was overclocking with the FSB, which I was able to get a stable 3.85GHz overclock which was alright, but definitely not grand. Also couldn't really do anything with the voltage in the bios, don't know if that was the motherboard either. -Heatsink isn't loud, it's like a jet engine. Ever since about 2014, it's ran at full throttle 24/7 regardless of temperature or load, and let me say that at 4,000 or 5,000 RPM (I can't remember where it sits) this stock cooler gets extremely loud. I've had to sleep next to this thing for four years, can't wait until that noise is gone, even though I guess I kind of got used to it. - Definitely starting to show age in modern games, MMOs in particular. Desktop performance isn't as good as it could be with a higher end CPU as well, but it's definitely good. - For some reason, in benchmarks like PerformanceTest, my RAM seems to perform quite poorly compared to other user's test results with the same RAM. I'm not sure if my RAM is underperforming due to my RAM required to be slightly underclocked (due to the FSB overclock), whether it's slightly faulty in some way, the CPU is not strong enough to utilize the RAM very well, or if other users have much better setups with this RAM on average and just have better on average systems allowing for RAM overclocking and such. Other Thoughts: Overall, I really loved this CPU. It's always been there for me when I needed it, but I think it's time to retire it and pick up a Ryzen 5 1600x. Pros: My first CPU purchase, had it for 6.5 years now. Finally putting it to rest next month (replacing with RyZen cpu). No problems ever occurred, even with daily usage. Cons: Stock fan is loud, replaced it with a quite aftermarket cooler. Pros: I've had this CPU for almost 5 years now and I couldn't have been happier. It never gave me any issue and has worked flawlessly since I purchased it. The stock cooler served well, with never having any threats of overheating. Amazing CPU!! Well done AMD. Pros: Great speeds. No Problems. Pros: I've had this cpu for over 4 years, and love it still. I dont see a need to upgrade for a few more years. It just does what I need it to. It's paired with an Asus 6850 v1, and Samsung 850 Pro 256GB, and they just work very well together. I've bumped it to 3.9 with only a slight voltage increase, but dont have a need for it, so didnt' keep it. I also use Asus' EPU power saving suite, and overclocks dont work with that. Other Thoughts: The only phenom that could outperform this at purchase date, was the X4 980, or the X6's. I wish I would have got the 1100T X6, as you can't find them, but I still love this one. Pros: Owned for more then 3 years and still works flawlessly. Been overclocked from day one and it hasn't skipped a beat. By far the best CPU i have ever owned.To bad there out of stock, I was going to buy a second one for another PC. If you can find one, BUY IT.